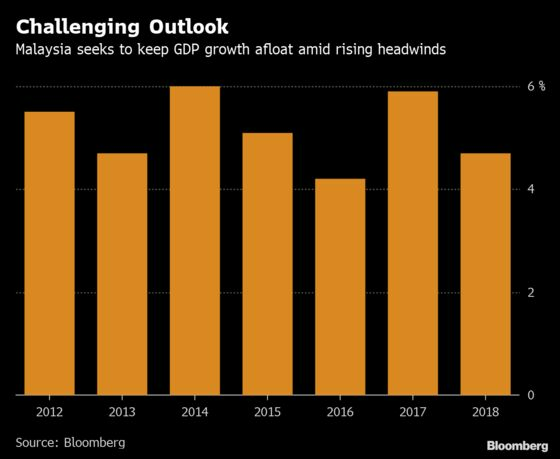 (Bloomberg) -- Malaysia lowered its economic growth forecast for 2019, and pledged to keep monetary policy accommodative as global risks weigh on the trade-reliant economy. Gross domestic product is expected to increase 4.3 percent to 4.8 percent in 2019, with trade tensions and lower commodity prices among the biggest wildcards, Bank Negara Malaysia said in its annual report on Wednesday. The projection marks a step down from the 4.9 percent expansion estimated in the government’s budget released in November, and compares with a 4.7 percent pace recorded in 2018. The downgrade in the growth outlook was mainly due to worsening global conditions, Governor Shamsiah Yunus told reporters in Kuala Lumpur. Growth will probably come in at the lower end of the forecast range if downside risks -- such as a sharper moderation in global demand and an escalation of trade tensions -- become reality, she said. Bank Negara joins a growing list of central banks that are acknowledging the increasing risks to growth, as moderating exports and weakening consumption spur bets for monetary easing across the globe. The Southeast Asian economy is also trying to keep growth afloat while reining in public spending to narrow its biggest fiscal deficit in five years. The central bank said it’s ready to delve into its tool kit to support the economy if needed, with targeted prudential policies and financial market measures among the options at its disposal. A flexible exchange rate also acts as a shock absorber, increasing the economy’s resilience when faced with external shocks, it said. Shamsiah said interest rate decisions will be data dependent, adding that the decline in the inflation rate in the past two months doesn’t reflect deflationary conditions, she added.